Chama River: Reggie Quintana of Santa Fe caught and released a 21.5-inch brown trout Feb. 2. He was using a worm. Elephant Butte Lake: Bobby Beall of Elephant Butte caught a 20-pound, 4-ounce striped bass Feb. 2. He was using a jig. Fenton Lake: Jack Wagoner, age 6, of Albuquerque caught and released a 10-inch rainbow trout Feb. 3. He was using a VMC glow fire tiger tingler spoon. 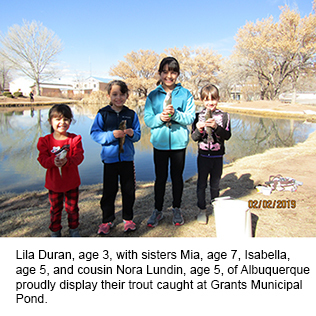 Grants Municipal Pond: Lila Duran, age 3, with sisters Mia, age 7, Isabella, age 9 and cousin Nora Lundin, age 5 of Albuquerque caught several trout Feb. 2. They were using worms. Lake Van: Liam DeHoyos, age 4, and Gian DeHoyos, age 5 of Artesia caught several rainbow trout Feb. 2. They were using corn and salmon eggs. 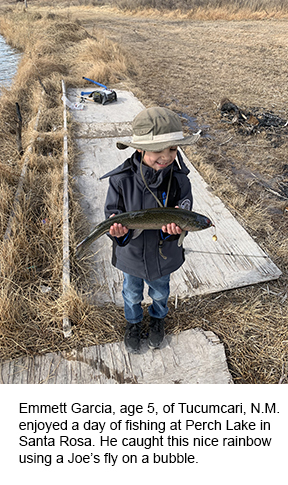 Perch Lake: Emmett Garcia, age 5, of Tucumcari caught and released several nice rainbow trout including one that measured about 14 inches Feb. 1. He was using a Joe’s fly under a bubble. San Juan River: Ken Arnett of Albuquerque caught and released a 31-inch brown trout Jan. 31. He was fishing between the Kiddie Pool and the Cable Hole and using a mouse pattern fly. 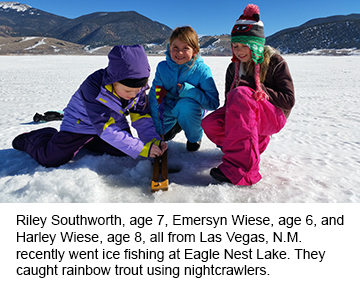 Eagle Nest Lake: Ice fishing was slow to fair for anglers using meal worms, spoons, PowerBait, salmon eggs and ice jigs for a mixed bag of rainbow trout, perch and an occasional northern pike. We had no reports on kokanee. As of this past Monday, the ice thickness was about 18 inches near the south boat ramp. Lake Alice: Fishing was very good using corn, PowerBait, Fire Balls and homemade dough baits for trout. Lake Maloya: Fishing was very good using PowerBait, corn, homemade dough bait, salmon eggs, small spoons and small ice jigs. Adonais Esquibel Jr. of Rio Rancho caught a nice 18-inch trout this past weekend. He was using a homemade jig. Pecos River: Stream flow near the town of Pecos on Monday morning was 24.0 cfs. Fishing was fair to good using Fire Balls in the Villanueva area for trout. Red River: Stream flow below the hatchery on Monday morning was 20.2 cfs. Fishing was fair to good using PowerBait, salmon eggs and copper John Barrs for trout. Rio Grande: Stream flow at the Taos Junction Bridge was 349 cfs. Fishing was fair using wooly buggers, baetis nymphs, copper John Barrs and spoons for trout. We had no reports on other species. Rio Mora: Stream flow on Monday morning was 4.34 cfs. We had no reports from anglers this week. Storrie Lake: Fishing was fair to good using Fire Balls, corn and orange PowerBait for trout. Ute Lake: Fishing was slow with just a few walleye and white bass caught by anglers using blade baits in 50 to 60 feet of water. We had no reports on other species. Fishing pressure remained light. 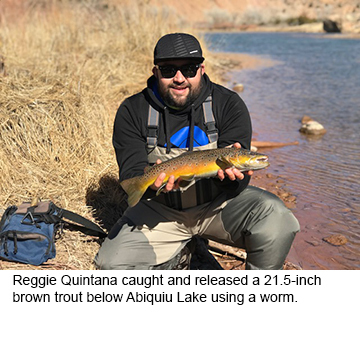 Abiquiu Lake: We had no reports from anglers this week. The lake level is very low, and the concrete boat ramp is completely out of the water. Albuquerque Area Drains: Trout fishing on the Albuquerque, Albuquerque (South), Belen, Corrales and Peralta drains was good using PowerBait, corn, salmon eggs and small bead head nymphs. We had no reports on other species. Bluewater Lake: The lake remains closed to fishing at this time due to thin ice conditions. For updated conditions, call the state park office at (505) 876-2391. Chama River: Monday morning flows below El Vado and Abiquiu were 25.6 cfs and 111 cfs respectively. Trout fishing below Abiquiu was good using copper John Barrs, wooly buggers, PowerBait, worms and salmon eggs. We had no reports from below El Vado. Fenton Lake: Fishing was very good using jigging spoons, corn, wax worms, salmon eggs earth worms and ice jigs tipped with PowerBait. The ice thickness varied from 10 to 13 inches. Heron Lake: The lake opened to ice fishing on February 1 with an ice thickness of 8 inches. We had no reports from anglers. For updates, check the state park web site or call the state park office at (575) 588-7470. Jemez Waters: Stream flow on the Jemez near the town of Jemez on Monday morning was 21.1 cfs. Trout fishing on the lower Jemez was good using worms, salmon eggs and PowerBait. A few were also caught by anglers using copper John Barrs. We had no reports from the other streams. Manzano Lake: Fishing was good using PowerBait and salmon eggs for trout. Navajo Lake: Fishing was slow to fair using large swim baits and deep running crank baits for northern pike. Fishing for smallmouth bass was slow with just a few caught by anglers using spoons and jigs. We had no reports on other species. San Juan River: Stream flow below Navajo Lake on Monday morning was 284 cfs. Fishing through the Quality Water area was good using red annelids, princess nymphs, mouse patterns, egg patterns, bunny leeches, emergers and streamers. Through the bait waters, trout fishing was fair using salmon eggs, PowerBait, streamers, egg patterns and worms. Tingley Beach: Fishing was good using homemade dough bait, Berkley power eggs, PowerBait, wax worms and salmon eggs for trout. We had no reports on other species. Alumni Pond: Trout fishing was very good using bead head prince nymphs, copper John Barrs, zebra midges, Velveeta cheese and corn. Bear Canyon Lake: Fishing was good using PowerBait, Pistol Petes and spoons for trout. We had no reports on other species. Bill Evans Lake: Fishing was fair to good using PowerBait, homemade dough bait and salmon eggs for trout. We had no reports on other species. Elephant Butte Lake: Fishing was fair using crank baits, jigs, spoons and blade baits for white bass and largemouth bass and one 20-plus pound striped bass caught this past week. Escondida Lake: Fishing was good using homemade dough bait, PowerBait, Fire Balls, Pistol Petes and spoons for trout. Gila River: Stream flow on Monday morning was 113 cfs. We had no reports from anglers this week. Lake Roberts: Fishing was good using PowerBait, corn, homemade dough bait, worms and salmon eggs for trout. Rio Grande: Stream flow below Elephant Butte Monday morning was 2.52 cfs. We had no reports from anglers this week. Alto Lake: Fishing was good using PowerBait, salmon eggs and spoons for trout. Berrendo Creek: Fishing was very good using PowerBait, small spoons and salmon eggs for trout. Bataan Lake: Fishing was good using worms, PowerBait and spoons for trout. Black River: Stream flow at Malaga on Monday morning was 15.8 cfs. Fishing was very good using Fire Balls and PowerBait for trout. Blue Hole Park Pond: Fishing was very good using PowerBait, salmon eggs and Velveeta cheese for trout. Bosque Redondo Lake: Fishing was good using wooly worms, PowerBait and salmon eggs for trout. Bottomless Lakes: Fishing was good using PowerBait and salmon eggs for trout. Carlsbad Municipal Lake: Fishing was very good using PowerBait, salmon eggs, Kastmasters and Pistol Petes under a bubble for trout. Chaparral Park Lake: Trout fishing was very good using PowerBait and salmon eggs. We had no reports on other species. Corona Pond: Fishing was good using PowerBait for trout. El Rito Creek: Fishing was excellent using PowerBait, worms and Fire Balls for trout. We had no reports on other species. Eunice Lake: Fishing was good using PowerBait for trout. Greene Acres Lake: Fishing was very good using small spoons, PowerBait and salmon eggs for trout. Grindstone Reservoir: Fishing was good using PowerBait, homemade dough bait, power eggs and salmon eggs for trout. George Schlemeyer of Ruidoso reported caught his limit of trout while using orange PowerBait power eggs. Jal Lake: Fishing was good using PowerBait for trout. Lake Van: Fishing was good using PowerBait, Fire Balls, Pistol Petes, Kastmasters and spinners for trout. We had no reports on other species. Oasis Park Lake: Fishing was good using PowerBait, salmon eggs and homemade dough bait for trout. Pecos River: Stream flow below Sumner Lake on Monday morning was 13.7 cfs. Fishing below Sumner Lake was good using PowerBait, Fire Balls and worms for trout. We had no reports on other species. Perch Lake: Fishing was very good using homemade dough bait, Fire Balls, Pistol Petes, Joe’s flies and custom tied flies for trout. Sumner Lake: Fishing was slow to fair using jigging spoons and blade baits for walleye, white bass and an occasional catfish. We had no reports on other species.